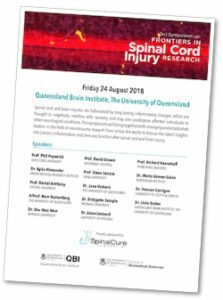 The 3rd Annual SpinalCure Australia Symposium on Frontiers in SCI Research was held 24 August 2018 at the Queensland Brain Institute. SCA believes strongly that uniting scientific minds to share research outcomes and progress can help accelerate the path to the cure. SpinalCure CEO Duncan Wallace attended the Symposium and reports back on key takeaways below. Spinal cord and brain injuries are hallmarked by long-lasting inflammatory changes, which are thought to negatively interfere with recovery and may also predispose affected individuals to other neurological conditions. 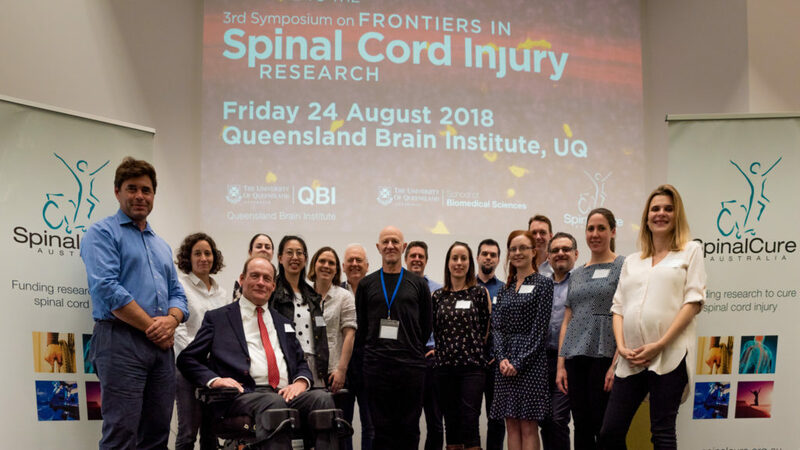 This symposium brought together both emerging and established leaders in the field of neurotrauma research from across the world to discuss the latest insights into neuroinflammation and immune function after spinal cord and brain injury. At SpinalCure we believe that research will progress much faster with greater collaboration between scientists. We were proud to sponsor this Symposium in the hope that the presenters would strengthen existing ties, forge new ones and inspire the next generation of researchers in the 100 strong audience. 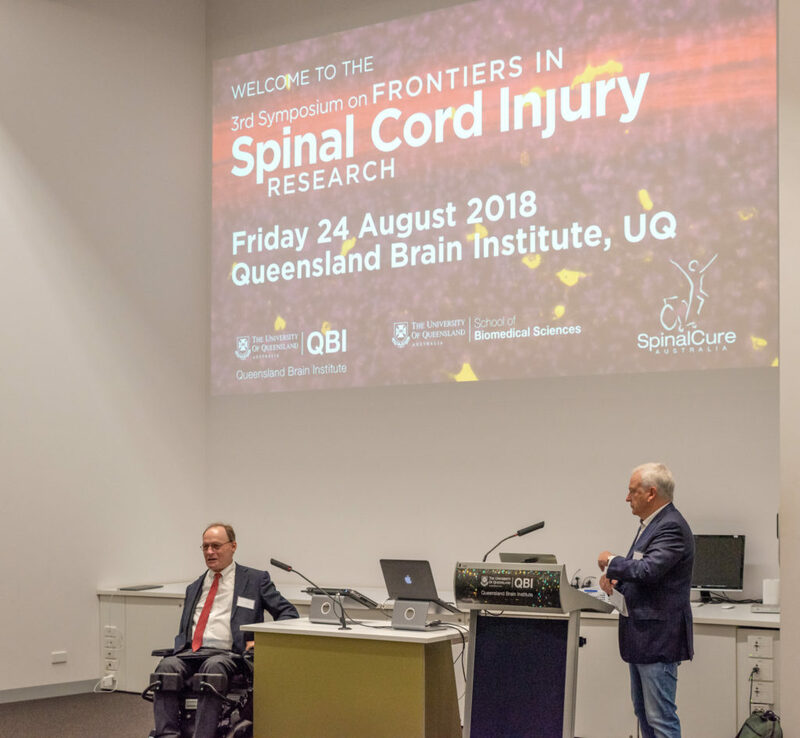 The day was opened by SpinalCure Director Prof Perry Bartlett who handed over to me to remind everyone about the devastating results of a spinal cord injury and why the work of these researchers is so important to everyone affected. Myself and Professor Perry Bartlett opening the Symposium. Sadly, Prof Phil Popovich from Ohio State University was stranded in the USA and unable to deliver what promised to be a fascinating keynote on the concept of manipulating the sympathetic nervous system and the gut microbiome to improve recovery after SCI. The freed up time was superbly filled by Dr Faith Brennan, formerly a member of A/Prof Marc Ruitenberg’s team at UQ and now working with Prof Popovich. For a layman, I thought I had a reasonable grasp of the science involved with SCI research but it immediately became obvious that the researchers have been talking to me in vastly simplified language. The majority of the knowledge imparted by the day’s presenters flew several feet over my head! However I grasped enough of what was being said to remain fascinated throughout all 14 presentations. I left the questioning to the experts though and was content to see our objectives of discussion and interaction between researchers talking place. The research presented ranged widely, touching on many aspects of the inflammatory response in acute injuries which affect not only SCI, but traumatic brain injury, stroke and also many neurodegenerative conditions. (Download the Symposium program for abstracts). The work presented was highly encouraging, especially regarding acute injuries. The researchers are making significant advances in our understanding of the complex changes which occur after the initial trauma. Identifying the detrimental aspects of these changes and developing ways to control them are key to improving patients recovery. The intensity of the scientific content was punctuated by three deliciously provisioned breaks on the sunny verandah of the Queensland Brain Institute. The conversations between researchers continued during these breaks and I enjoyed talking with students from UQ who I hope will consider SCI research for their careers. We capped the event off with an opportunity for attendees and speakers to get to know one another over dinner. Thank you too to all the scientists who generously took time to come and share their work.